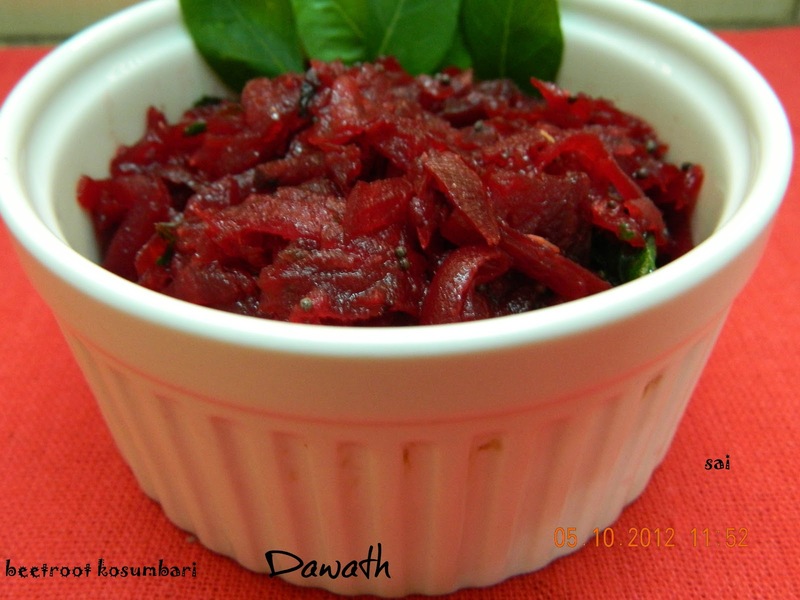 Beetroot kosumbari is a healthy salad served with the main course.Beetroot is very good for health especially to boost the hemoglobin level.It is said that it is our Liver’s best friend.It is a super storehouse of iron and Vitamin C.Coming back to the recipe I adapted this recipe from Santoshi and is one of my personal favourite salad. Wash ,peel and cut the beetroot into 4 pieces and put it in a bowl. Take a pressure cooker with lil water and keep the bowl with beetroot inside it. Take a whistle and switch off the flame. Once the pressure releases,open the lid,cool the beetroot and then grate it. Heat oil in a small seasoning pan,splutter mustard seeds,add curry leaves and season it to the beetroot. Paste the green chilly and add it to the beetroot along with chopped onion and salt to taste. Garnish with coriander leaves and add a dash of lime juice. You may also use the raw beetroot if you like. When you steam or cook the beetroot in the cooker it releases lil water, use it in the salad without discarding it. You may add curds just before serving . Option of adding the curds can be left open to the eaters by keeping it in a separate bowl. You may exclude onions and add Asafoetida while tempering. But if you add Asafoetida please take precautions, add it once you off the flame,or keep it in a low flame since there are chances of burning or at times flame raises.